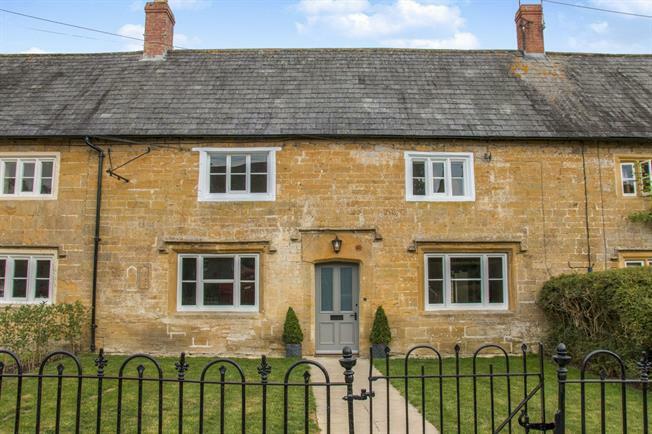 3 Bedroom Terraced House For Sale in Martock for Guide Price £450,000. Approached from Church Street through the lawned front garden enclosed by railings. Panelled and partially glazed entrance door inset to Hamstone arched surround with coach light above. Suite comprising of close coupled W.C, wash-hand basin, heated ladder style towel rail, slate floor and extractor fan. Stone, mullion window, overlooking Church Street with a deep window seat below. Hamstone fireplace with inset wood burning stove, exposed beam, period style wall lights, radiator. Stone, mullion window, overlooking Church Street, with cupboards below, glazed leaded window to the hallway, exposed beam, radiator, opening to the kitchen. Double glazed window to the rear elevation, fitted with a comprehensive range of, recently installed, panel fronted base and wall mounted units incorporating glazed display units, Oak work surfaces with matching splash backs, deep double bowl ceramic 'Butlers' style sink unit with stainless steel mixer tap above, range of integrated appliances including refrigerator/freezer, dishwasher and wine fridge, freestanding 5 ring electric range style cooker with two ovens and a grill, exposed beam, understairs cupboard, opening to the garden room. Wide bi-fold doors overlooking and providing access to the garden, twin double glazed windows to the side elevation, stable door to the garden, radiators, access to a loft space. Stable door to the garden, skylight window, slate floor, plumbing for a washing machine, radiator. Window to the front elevation overlooking Church Street, central 'Period' fireplace (sealed), radiator, shelved cupboard. Comprising corner shower cubicle with tiling ,pedestal wash hand basin, low-level W.C, shaver socket, extractor fan. Double glazed window overlooking the rear garden, built in wardrobe cupboard with hanging rail and shelf, radiator. Stone, mullion window, overlooking Church Street, wardrobe cupboard with hanging rail and shelf, radiator. Fronting Church street with railings and hedge boundary, laid to lawn. Fully enclosed by a high stone and brick boundary wall, laid to lawn with raked gravel seating area, external tap. Single size garage with parking.